On the afternoon of April 11, 2019 local time, Premier Li Keqiang met in Dubrovnik with Prime Minister Boyko Borissov of Bulgaria, who was here for the summit between China and Central and Eastern European Countries (CEEC). Li Keqiang expressed that the China-Bulgaria relations will embrace new development opportunities as this year marks the 70th anniversary of the establishment of bilateral diplomatic relations. China is willing to take the anniversary as an opportunity to well hold a series of celebration activities, and enhance bilateral cooperation in areas including infrastructure construction and agricultural technologies. The Chinese side encourages more competent Chinese enterprises to participate in infrastructure construction projects in Bulgaria, and welcomes more exports of Bulgaria's high-quality agricultural products to China. China is willing to further enhance people-to-people and cultural exchanges with Bulgaria. The Sofia China Cultural Center will start operation this year, which will help further consolidate the public opinion foundation of the two countries. Li Keqiang stressed that important consensus was reached at last year's China-CEEC summit in Sofia on setting up in Bulgaria the Global Partnership Center of CEECs and China. During this year's China-CEEC summit, there will be an inauguration ceremony of the center. It is believed that the center will provide strong intelligent support for China-CEEC cooperation. 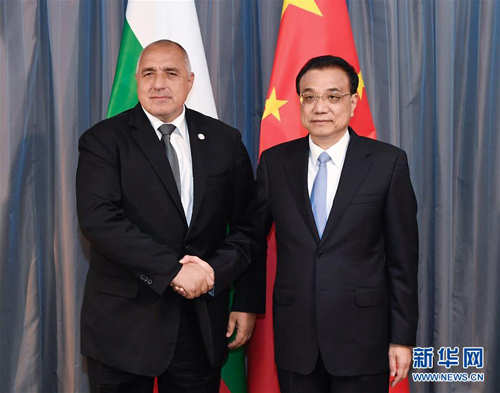 Boyko Borissov said that Premier Li Keqiang's successful visit to Bulgaria in last July has promoted new progress in bilateral relations, and the two sides have achieved fruitful results in areas including agriculture, tourism, and infrastructure construction. The Bulgarian side stands ready to, together with the Chinese side, further deepen connectivity for more practical outcomes, and build the Global Partnership Center of CEECs and China into a provider of useful policy consultation and support for all parties in practical cooperation. Wang Yi and He Lifeng attended the meeting.